"These Audio Catechism (CDs and Downloads) and Copybooks are so great! How did you do them?" The answer? Our story rests on the grace of the duty of state and listening to good advice. We listened to the advice of good priests and religious to teach the First Communion and Confirmation basic Catholic beliefs to our own children, and we wanted to teach them well. 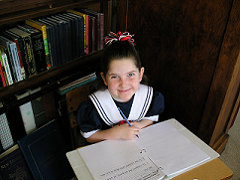 Our story began years ago when our oldest child was preparing to receive her First Communion. We were told that the date would be in August. The next pastor said that First Holy Communion day would take place in September or October. So we continued to review the Baltimore Catechism questions and answers. Yes, you might have guessed it, the date was finally Mother's Day the next year! We didn't guess it at the time; yet by November we had told our daughter that once she could pronounce and remember each catechism answer well enough, we would add both the question and answer on a cassette. Then she could keep and review it at will, even while she played with her sister and brother, colored pictures, or worked on crafts. Voila. Our first audio catechism! That same season our pastor asked Mary to teach the First Communion catechism for our very small mission chapel. It seemed like it would be easy enough. Wasn't it for very small children? Yes, the children were small, but the responsibility of teaching other people's children was huge! Just as we wanted to be sure that our own children could answer well, we wanted to help other children do the same. We taught what Father had assigned on Sundays, and the children learned well with their own parents' help during the week. Note the parents. The parents are the main teachers whether your child is in class or not. Sr. Mary Catechism and Mrs. Catechist present what they can, yet the best reinforcement and encouragement starts and continues at home: devotion, attitude, review. The Sisters at the new location were using a much better set of questions and answers from an excellent First Communion book called Jesus Comes from the series Our Holy Faith. A good many of these answers were the same as what we'd already studied as they are all based on the Baltimore Catechism, yet there were some excellent additions, too. After we taught the children to pronounce the answers and had reviewed with them nearly every night sometimes several times a day, they could remember the answers for Sister's class and more importantly... for life. Wow! Time to do another cassette for daughter number two. At this time we had had even less time available because two of our children were learning from different books, they were away at school during the day, and baby number five was on her way. Simply, two different catechisms were being used in the same school. No time to look into it. Mom and Dad needed the review help of the audio cassette even more! Put all of the questions on the same cassette! Later, we moved to a new home and I lost that second cassette. Getting all of the answers recorded became a new priority since we soon had eight children, another child in school, and they all needed more review while I had less time. I wish I'd had some kind of Catholic tutor, someone who would help me review with the children; yet with them in school we wouldn't have had the time or the money. We needed to get the answers recorded again. We had our task cut out for us, especially to record the answers in a six-year-old user friendly format. Rewinding a homemade cassette was not the easiest task for some of our little ones, and led to the next step in our audio catechism story. How could we make the catechism easy for the children to review? On their own. How could we make it so the older children (or adults) could learn "by osmosis" or review from past years? Audio Baltimore Catechism CDs were the answer. Our local computer expert showed us how to produce professional CDs. We put all of the questions and their answers that are usually asterisked to be memorized for First Communion and Confirmation on their own CDs. And each question and answer on their own track for easy navigation and review. Track numbers could now match the question numbers of the booklet that could be included on the same enhanced CD. Huge relief to Mom and Dad! 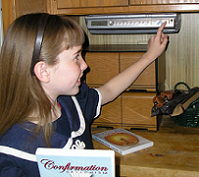 The next chapter in our audio catechism story is that we began giving the Catechism CDs to our Godchildren, nieces and nephews, friends and acquaintances - even if all they did was share the grief of squeezing review time into their busy days. It was our way of helping our neighbor. It was so easy to help the Moms help the children. Soon, as word spread, other parents began asking for a copy as they they could see that the CDs were such a huge help. At one point a lady came to the door wanting to buy a copy. Cash in hand! Soon we could not afford to continue handing out the audio CDs for free, especially every year. Dad looked at Mom and said we need to do something different. We saw that this was the beginning of a true apostolate, as confirmed by the testimony of several good priests and religious. We needed a name, so one of the children came up with Saint Anne's Helper. St. Anne is the patroness of those who teach their children. Being mother of Our Lady and grandmother to Jesus gave us great confidence in her protection. We started building our tiny business in 2007 after perfecting our CDs. We worked hard to develop and publish them in a professional format. Enhanced CD - Meaning that there is an audio and text file on each CD. Too cool! You can print the text at any time. Copy it to your computer for future children. Professionally designed labels for cover and CD. White DVD box for durability and easy recognition. "Go get the white one." We presented them to many major Catholic book publishing companies and Catholic book sellers. Several book sellers were our largest customers. Priests, catechists, parents, students and converts have written to thank us for our apostolate; but guess what? We had no venue to reach the larger market for Catholic audio book CDs. So, long story short, after nearly two years working the usual venues, we found that it was hard to convince bookstores to sell our CDs. They already had their supply lines; and few people had heard of an audio catechism - of course. In those days this was a brand new idea. Then my sister said, "You need a website." She and her husband had already set up their successful website and knew that a website was what we needed to sell our CDs and build the base for a larger Catholic business. Well, we saw their success and decided to use their good advice. We began to build this website in December of 2008. At the beginning we had not known much more than how to use email, yet we have learned to do so much more since that time. Now, after using a step by step tutorial of how to do all that we have done; we have organic traffic and many Catholic companies, parishes, schools, and families use our products. As an aside building this website has been a great education for our high school graduates. Which means that there are now several of us in our family who know how to build their own successful websites, navigate the internet, and produce beautiful graphics and printables. Except for tweaking and for adding new material, the site pretty much takes care of itself now. A real benefit is that traffic has grown even when we do not "work" on the site. If you're looking to build your own website, you'll like the tutorials here. They have wonderful stories of people building their own businesses here. Our experience? See my SBI review here. As a result of the step by step process for creating a website with focused traffic, we also learned how to sell our CDs as downloads. Visitors now had none of the hassle and expense of shipping and handling; and our visitors could receive their products immediately. Win. Win. We also have international friends as a result. Let's just say it's so great to be able to help you to find good catechism resources. It is a highlight in our of our day when you write to tell us how you've benefited from using our downloads. Catechism copybooks to match the CDs. 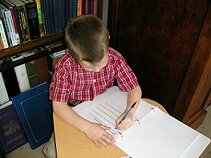 Children could have practice with spelling and handwriting. Expanded to both manuscript and cursive writing. First Communion and Confirmation ebooklets. Printable coloring pages of saints, churches, and sacraments. All are available as instant downloads. We also have a monthly holy day reminder. We now also offer an excellent audio Douay-Rheims Bible and free Rosary videos. If you have a Catholic business you might be interested in being our affiliate. Thank you for visiting! If you like what you see, we appreciate your sharing our audio catechism story.